2. Brush oil onto one side of a tortilla, and place on a plate oil side down. Spread about 1/2 tablespoon of mustard on the top side, and top with green onion, apple slices and about 1/2 cup of shredded cheese. Place a second tortilla on top, and brush the top with olive oil. Repeat with remaining ingredients, stacking the quesadillas on the plate. 3. 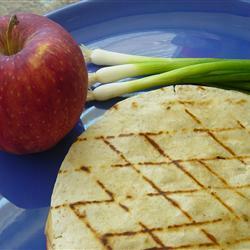 Brush the grilling surface with oil, and place the quesadillas carefully on the grill. Grill for about 3 minutes, or until the bottom is crisp. Flip, and grill on the other side until crisp. Remove from the grill to serving plates and cut into quarters. Serve warm.